When presenting such an iconic and classic musical such as this which is famous throughout the world as one of the most watched and enduring film musicals ever - even the Austrians now know and love the show - it is terribly difficult for any casting director / producer to find the right balance between audience expectation and creativity / expression. Did Bill Kenwright therefore manage this? I believe he did, yes. Sadly the set did not live up to expectations, and was decidedly ill-fitting in both senses of the word unfortunately. Maria's garret bedroom at the Von Trapp mansion had both gaping holes in it whilst being wrong for the style of mansion, and the decor not quite right. However, the Hapsburg yellow used for both the abbey and mansion ballroom was correct. It was also really rather unfortunate to have Maria singing in the mountains whilst majority of the Von Trapp mansion was all around her, including the marble floor! Anyway, set niggles notwithstanding, I really enjoyed this show. The build up of Nazi take-over and the Anschluss was excellently played, and in general the characterisations were an utter joy with their journeys and arcs very real and sympathetic. 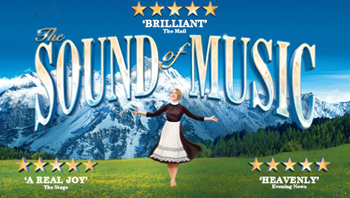 The story of The Sound of Music, concerns a young novice at Nonnberg Abbey in Salzburg who is sent to work temporarily as a governess at a large mansion nearby. The mansion is owned by ex-naval captain Georg Von Trapp and his 7 children. He runs the household with military precision and Maria's arrival signals the softening of his heart and the bringing back of music to the home, and also the development of a love that sees them marry and of course, escape the Germans as they travel to Switzerland. The story is a highly romanticised version of a true one. There really was a captain and Maria Von Trapp and they did have a famous singing family, and they did escape the Germans. Although unlike the musical (both stage and film version) they did not climb the mountain - this would only have led them straight into the Eagle's Nest and Hitler's southern Bavarian stronghold, but went instead by train first into Italy before the borders were closed and then eventually into Switzerland and then America. Lucy O'Byrne was an excellent choice for Maria. Her pure and excellently articulated vocals giving a hint of Julie Andrews, and yet being a totally fresh and inspiring character in her own right, whilst Neil McDermott was a very odd choice for Captain Von Trapp. Somehow he didn't seem erect and Austrian enough. In fact he did look a little weary and distracted at times during the evening. I think he invested a great deal into the role, but sadly I think he wasn't quite right, and certainly his singing was just as good as Christopher Plummer's! Megan Llewellyn's very human and likeable Mother Abbess had a little more fun and joie-de-vivre than I have previously seen, and I really liked this. And her rendition of Climb Ev'ry Mountain deservedly received the loudest applause of the evening. Elsa Schraeder (Kara Lane) and Max Detweiler (Howard Samuels) made a great duo and worked against each other and Georg and Maria superbly. I also really enjoyed Frau Schmidt (Pippa Winslow) too. This is a role that can so easily get overlooked and yet tonight I was drawn to her on her every entrance. This musical though stands or falls on the quality of the children. Katie Shearman plays Liesl in every performance, whilst the younger roles are shared between three teams. I am uncertain which of the three teams performed this evening, but they were, in a single word, wonderful. Their individual characters as well as a communal emotion were a joy, and their singing and acting was truly inspirational. All in all, a little sugar-coated but a well realised feel-good show for all the family, and is highly recommended.